Bronzer Bunny told me I should try the African Botanics Marula Intense Skin Repair Balm several times last year, especially noting how much it helped with her scars. I finally got around to trying it, and can't believe I waited so long because I love it! When I purchased this it was called the Intense Skin Repair Balm, and came in a slightly smaller size (the one shown in the pictures above). 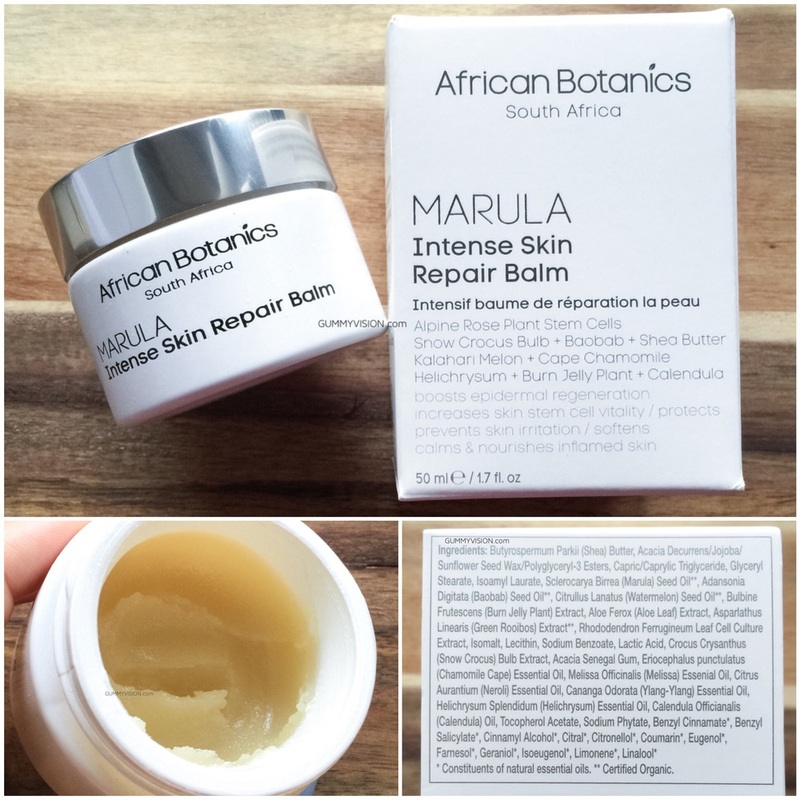 When I looked up the info for this post, I see that it's now called the African Botanics Marula Intense Skin Repair Body Balm...and is more expensive for a slightly bigger container...oh, and the packaging is different. It's now $55/1.96oz. I assume it's the exact same product, but all the online ingredient lists I could find (Spacenk, Beauty.com, Dermstore.com) seemed much shorter than the one listed on the package I have. I've ordered another one, but until I receive it I won't be 100% certain it's the exact same thing. I'll update this post when find out for sure. Either all that or they just sent me a really old one, because Bronzer Bunny's review, HERE, from last year says Body Balm. Not sure...but I'll definitely update. The top picture is how the Balm looks straight out of the container. It has an almost a gritty feel until it's all rubbed together and melted. In the bottom picture, the right side is the product smoothed out a little because I wanted to show you how oily it actually is if you use too much or until it's rubbed in completely and absorbed. The glob is after a few minutes of sitting on my hand (while trying to get a good pic), so it's a little melted as well. Contains mega doses of many healing botanical nutrients and provides intense hydration. Increases circulation to help speed up the healing process of the skin. Tightens the connective tissue and creates a moisture barrier. Ideal for dehydrated skin, winter months, dry climates, windburn & sunburn. Moisturizes and calms dry & sensitive skin. Heals cuts, burns, dermatitis and eczema. This also works really well to restore haggard looking cuticles and rough elbows and knees. I've also tried it under my eyes, though for some reason it doesn't seem to work as nicely on that area and the Sisley Eye and Lip Contour Cream still remains my favorite. So all of this sounds great but not so outstanding as perhaps other balms might be. BUT, let me add one more thing...this Balm seriously heals. I've had several really rough, chicken-skin like patches on my shins and one on my hand since last November. I've used various cortisone cream concoctions and the rough patches do get better, but they've never actually disappeared. I don't like using cortisone for extended periods of time, so even though the rough patches would get better, inevitably they would also get worse when I stopped using the creams. I don't know exactly what the rough patches are as I've yet to see a dermatologist (I know, please don't revoke my beauty addict card! ), but I'm guessing it's some sort of dermatitis that I've yet to find the source of (have tried eliminating foods and changing things like laundry soap to no avail). Anyway!! Point being that I started using the African Botanics Marula Intense Skin Repair Body Balm on the rough patches and after a few weeks they are almost all gone!! I only have one left that's super close to being kaput!!! I think that says a lot about how fantastic the healing power is.